In 2014 the Sewol ferry was carrying 476 people when it sank, and of the 304 who died, 250 were pupils from the same high school on an organised trip. 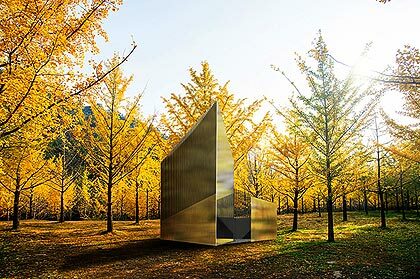 Sewol Memorial Forest was first proposed at last year’s first anniversary of the sinking to the social enterprise Tree Planet and the group 4/16 Sewol Families for Truth and a Safer Society by Sean Hepburn Ferrer, a human rights activist and son of famous film actor Audrey Hepburn. Audrey Hepburn served as the Goodwill Ambassador for the United Nations Children's Fund from 1989 until her death in 1993. On April 10, 2015, the bereaved families and Audrey Hepburn’s family planted the first 30 trees at the ‘Sewol Memorial Forest’. Now over 300 Ginkgo trees have been planted in this forest. This message was delivered at a ceremony in Jindo, South Jeolla Province, to mark the completion of the memorial forest commemorating the victims. Location: Baedong Mugunghwa Island Park, 4.16 kilometers away from Paengmok Port, the nearest land site from where the MV Sewol sank.